We were absolutely thrilled and delighted to welcome Mr Alex Tear, the Diocesan Director of Education, to our school today. After hearing of Mr Tear's impending visit, one of the Year 6 boys felt compelled to write a formal letter, explaining the exciting learning that the class were planning to share at their outcome during his visit. The children in Year 5/6 became Mr Tear's guide during their Science outcome and the children proudly presented Mr Tear with certificates for completing a fitness session and making a blood smoothie! The children in Year 1/2 were busy preparing their class zoo (see the giraffes below!) and Year 3/4 were absorbed in their 'game zone' creations - but all the staff and children greeted Mr Tear with a huge, welcoming smile. 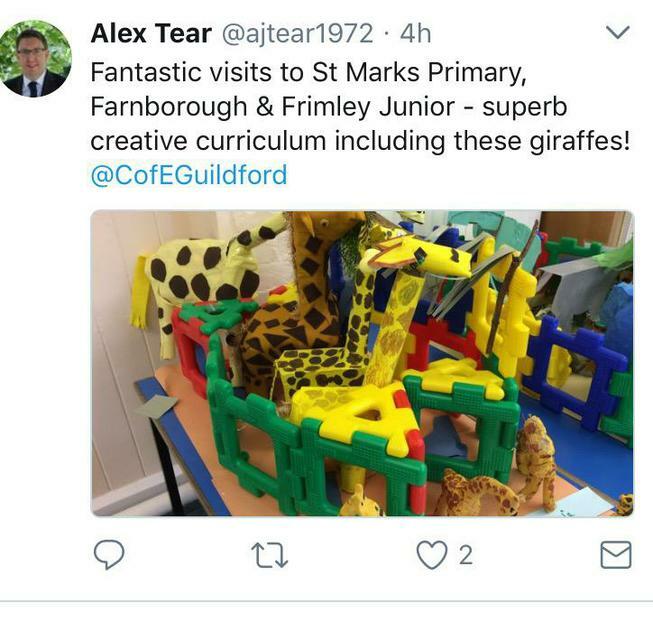 We feel very proud to feature on Mr Tear's twitter page with some of our zoo members in Year 1/2! We look forward to welcoming Mr Tear back to our school very soon.